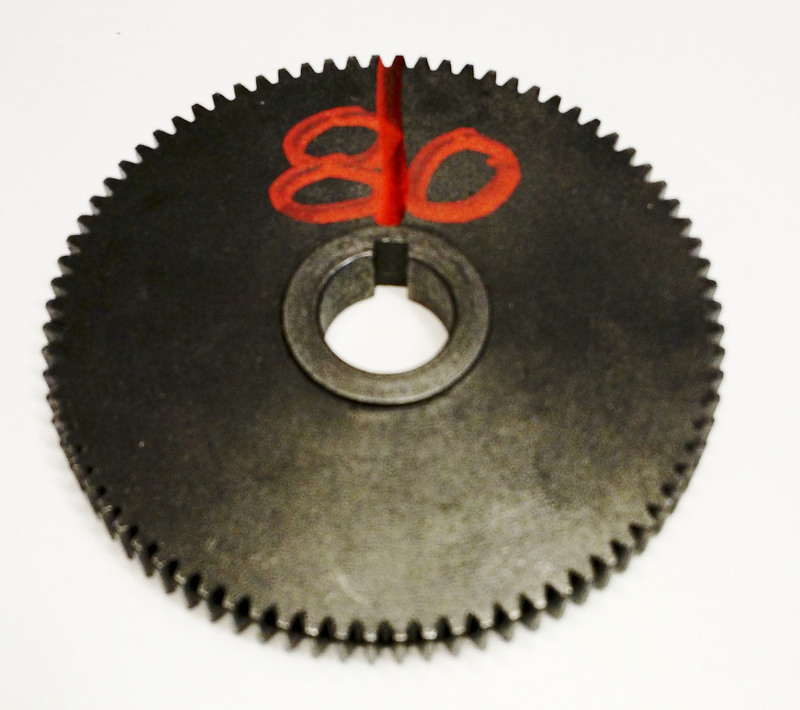 Some vendors (for example, see here) advertise that the SC4 can cut threads as coarse as 8 tpi, but this is false; with the standard gear set, the coarsest possible thread seems to be 5 tpi (gears 60-100-127-30). An elegant table of useful gear combinations is available about halfway down this page. I mark both sides of each gear with an oil-based pen, indicating the gear's size and (most important) the position of its key slot. Using the latter mark, I can be sure that the key is on top of the shaft (and not likely to fall out) before dismounting the gear. Fixtures that make the lathe more rigid add to its ease of use and to the quality of its output. Some of my approaches to increasing the rigidity of the SC4 lathe are described here. To allow a Proxxon rotary tool to be used as a toolpost grinder, I bought a mounting block from Little Machine Shop. I knew I could have made the mounting block myself, but the LMS version was inexpensive, and I thought I could put it to immediate use. As it turns out, the LMS mounting block is not immediately compatible with the C4 lathe. The bolt and sleeve of my QTCP were not appropriate for attachment of the mounting block to the compound, and I needed a 0.1" shim under the mounting block to get the axis of the Proxxon tool up to the level of the lathe axis. I obtained my lathe from Machine Tool Warehouse in Ontario, but they provide a fragmentary manual and no competent support. It turns out that the same lathe is marketed by Little Machine Shop, and their excellent manual is available on line. An even better manual was produced by Robert Ackert; it is available here (revised 2014-05-21), subject to your acknowledgement that it is copyrighted material, used by Ackert's permission, and that downloading and printing are permitted only for personal use. Reproduction in any form for commercial purposes will require separate written permission from Ackert. Whenever a lathe workpiece is not circularly symmetric, progress can be visually assessed only when the lathe is stopped. I developed and installed a timing light, similar in concept to the timing lights used by auto mechanics, that allows the spinning workpiece to appear still. The timing light is described here. Especially for threading, but useful at other times too, I have installed electronics to force the spindle to stop or to reverse when the carriage has advanced to a chosen point. That project is described here. I have had no electrical problems with my lathe, but Bob Ackert has advised me that such problems can sometimes arise through failure of the shoddy, European-style fuse holder on the front panel. He replaced the fuse holder in his lathe with a standard, North-American style holder. My most useful commercially-obtained add-on to the lathe has been an ER32 collet holder and a set of ER32 collets. The collets are available everywhere, but the only evident source for the collet holder seems to be Axminster. Short of dealing directly with Sieg, the only source of replacement parts for the SC4 lathe may be Little Machine Shop.